Programs such as Microsoft FrontPage will do a lot of work for you if you want to produce web pages quickly and it can be quite helpful if you are in a hurry and you are not that bothered how your code looks and how it renders on various web browsers. You would expect that it would render all right in IE after all. This is the same page as rendered by Firefox. If you are wondering what has happened to the menus on the left and the right, they are still there and the scroll bar at the bottom should give a clue as to what has happened to them. Firefox, it seems, looks at the list of thumbnail images and notes correctly that there are no spaces between the tags and therefore they should not be wrapped at all. This is how it is arranged on the page. If only they made monitors with 4:1 aspect ratios. This is how it renders on Konqueror. Whilst Konqueror might seem to aim at a small market, its KHTML rendering engine is the one that is used by Mac OS X's Safari web browser so, if you can get your pages looking all right on these three, you have a lot of the Internet's browsers sown up (okay, so there are others but so far, nobody's sent me a press copy so that I can evaluate them). You might notice that the thumbnails are rendered as a table. In the code for this page, there are spaces within the tags that appear every block of six thumbnails. It seems that Konqueror sees these, works out that it ain't going to fit on the page unless it breaks it up some way and so decides to break it there. Looking at the code, I would say that that was the intention. One way of doing this is to use embedded, floating frames - these are called 'iframes'. They are like images in that they can be placed anywhere on a page but they are also effectively a little browser window. Like normal frames, you can give them names and as a result, get other hyperlinks to load new pages into the iframes, using 'target="whatever"' in the anchor tags. You will need to have a regular page that loads the images but also you will need a web page that contains all of the thumbnail images and one each for the full-sized images. Whilst this might sound like a lot of work, you can write a Perl script to do it automatically for you. One to have the image we want to view. 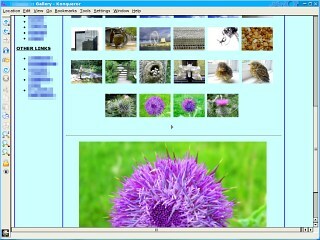 Note, if you only need to display full-sized images that are all the same size, you can get away with a second iframe window that only displays the image - if you need to display different sized/aspect ratio images or you need to add more coding (such as links or notes) you will need to create a web page for each image. So, first of all, what images and pages do we need and what is a reasonable way to structure them? Here, you can see the directories with their files in them. 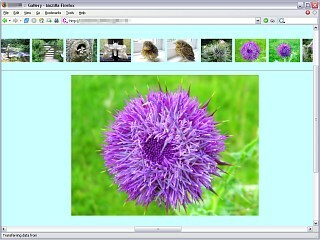 Note that in 'thumbs', there is the gallery strip page - galstrinp.html - which we will cover later on. The coding for an iframe is quite simple and is largely like the image tag (although you needs a tag pair for some reason and usually, there is nothing between the start and end tags). We will organise it using tables as this is robust in almost every browser. Note that if you click on the strip above, the image will change in the iframe just above. It is set out as a table so that it is robust. If you had pictures which were a mixture of portrait and landscape, you could use align="center" and valign="middle" within the <td> tag to make sure that everything was spaced nicely - use hspace and vspace to modify this was well if you want to. You can also (as you are coding this by hand) use the alt tags so that each image can have a description if you want. Note that each thumbnail image is a hyperlink to a page (or it could be just an image if you wanted) that is then targetted at the other iframe - the one called 'mainpic'. One other thing of note is that the body tag takes leftmargin="0" and topmargin="0" so that there is no space at the top or left of the window. If you left this out, you would get a gap on those sides and it would mean that the iframe window needed to be taller than the images. Also, note that the iframe height for the strips needs to be tall enough to hold the scroll bar (which is usually around 16 pixels high) so take your maximum image height (plus twice the vspace value) and add 16 to it to get the height of your thumbnail image strip with scroll bar. ...again, note that the image is in a page that has no top or left margins and also, that there are no spaces between tags within the body (this can be interpreted differently between browsers so iron out any potential for disagreement here). So, it is already to assemble as a page and on the right, this is what it looks like. If you click on the image on the right, the full-sized version will open up in a new browser window and you can play around with it. If you click on the image on the left, you will open up the directory in another browser window with the files in it so that you can have a look. If you want to do photography in an objective way, you need to standardise the way that you do things. One element of that is to standardise the input part of taking a photograph. The problems is getting hold of something that has standard densities. On the right, you can see a shot of the Kodak Professional Photoguide (ISBN 0-87985-100-7, first edition, first 1981 printing). I dare say that there are others but I have used this one for years (since 1981 in fact). The idea is that you take your photographs and also, in the same lighting, a picture of this. Then, you can modify your processing so that the final prints have roughly the same densities as the images on the right. Why would you want to do this? Because, if you were taking pictures of paintings or something else that had to be reproduced accurately, you would need to get it right. So, what do those numbers mean? On the left is a matt sheet of 18% grey card. This reflects 18% of the light that falls on it and being matt (it is a fairly good matt finish as well), it will give you a good idea of the incident light at that point. If you aim a light meter at this (from around 6" or 15cm but so that you don't cast a shadow on the card) you will get the same reading as if you slide the little white dome over the sensor. So, if you have a light meter without a white dome, use one of these instead. 18% grey is also the average colour of your image if it is exposed correctly. On the right, there is a fold-out section with the primaries and skin tones on it - along with their names so that you can recognise which is which if they get separated in the processing - and, a photographic print of some standard exposures. These have the absorbencies printed on them and that allows us to work out the values for correction purposes. To work the other way, we can use a calculation that gives us the proportion of light reflected and then - as we are working with a system that gives us values between 0 and 255 - we can multiply that by 255 to give us our RGB values. ...and that will give the proportion of reflected light (This is not to be confused with reflectivity which is the power and therefore (I/I0)2 ) as the penultimate line and the RGB value as the last line. Our absorbency test sheet has the following values; 0.1; 0.4; 0.7; 1.0; 1.3; 1.6; 1.9; and 2.2. For good measure, I'll throw in the figures for the 18% grey as well. So, now you know what to aim at with your colour corrections. Just in case you can't find such a reference, if you click on the image on the right, it will open up such a reference in a new browser window. You can either print this out on your own printer or, you can click on the links in that page to open a JPG or GIF image of the page that you can then copy to an SD card and get printed out at a chemist or photography shop. After a long hard holiday of taking photographs, you will, once you have recovered from the exhausting process of getting back into the swing of things, like to look at your digital pictures. However, there are some limitations to digital images and there are some features that lead to problems that more conventional cameras tend not to suffer from to the same degree. Digital cameras tend to have a large screen on the back that allows you to see the image in a way that is analogous to the view through the viewfinder of an SLR camera. The main fault with this is that it is always perfectly aligned with the scene - if you tilt the camera, the scene stays aligned. Whilst this is true of both systems, with a viewfinder, you put your eye up to the eyepiece and if the view is not straight with the border of the finder or any structures within it, you straighten it up. So, the first thing that needs doing is straightening the image. Next, many people who use digital cameras will not have used a conventional camera and then taken their film through the developing process themselves. So contrast reducing masks (which would need a higher dynamic range than a normal digital camera would give in the first place) and other darkroom tricks are not familiar to them. 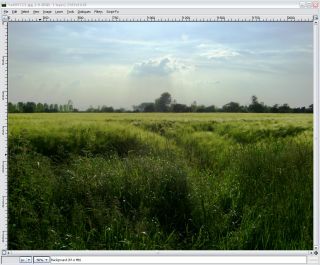 In fact, most people who process their own digital images on their home computer will only have used gamma correction to lighten or darken their images. Some of them might have adjusted the limits as well but that is about it. This is usually the fault of the image processing programs that come with digital cameras. Lastly, many places you visit will have traces of human activity that you might want to remove. Whilst this is best done before you take the shot (moving chairs or bins or other things) there are some objects that you cannot move such as the National Grid's power transmission cables and pylons. So, to summarise: we need to straighten the image; adjust its tone ranges; and then, clone out anything we don't want. There are other steps but we are not covering them here. But what program can do this and the many other things that we need to do? Fortunately, we don't need to spend hundreds of pounds on any commercial program to get what we need as there is a very good quality program that is free. 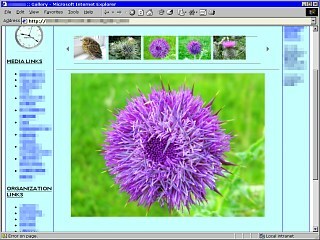 It is called the GIMP and if you can't get a copy from the PC Plus SuperDisc, you can download it from http://www.gimp.org/. In addition to running on Windows, it also runs on Mac OS X, Linux and UNIX and, it uses the same interface in each of these OS groups so if you learn how to use it on one, you can use it on the others. On newer versions of the GIMP, you need to turn on dynamic keyboard shortcuts (this allows you to program the key combinations - you can use the existing combinations or those that you have already programmed whether this is on or not). Here, as an example, we will introduce a shortcut key combination for the 'Levels' dialogue box. 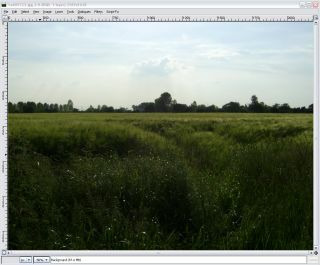 First of all, right-click on an image (any image will do) and then work your way through the menus until you get to where you want - in this case 'Layers'/ 'Colours'/ 'Levels...' and without clicking on it, make sure that 'Levels...' is highlighted and then press [Ctrl][Alt][Shift][L] and this key combination will appear as you can see it in the screen shot. Now, whenever you press [Ctrl][Alt][Shift][L] (it doesn't matter which order you press the modifying keys [Ctrl] [Alt] or [Shift] as long as you press [L] when you have the others already pressed), you will get the 'Levels' dialogue box. These keyboard shortcuts will be saved if you have that box checked and you can, if you want, reset them to the original set of shortcuts you had when the GIMP was installed. In addition, you can program other key combinations for other features at the same time. This is the image we are going to use. As you can see, it could be from somewhere in the American Mid-West but in reality, it was taken just a few miles away from a Japanese car factory in the English Midlands. It was taken with a digital camera using the TFT display on the back of the camera which will always give a correctly aligned image. You can see from the border of the photograph that the camera wasn't straight when it was taken. If we look at the image as we would see it on the computer, we notice that there is a distinct tilt. 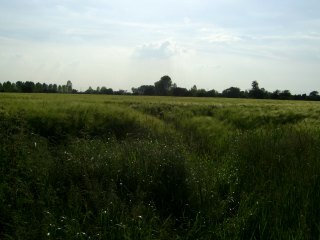 This ground is flood plane and is essentially flat and horizontal so it is not that, it is the camera. So,click on the 'Rotate' tool in the GIMP toolbox and then click on the image itself. In the middle of it, there is a little filled grey circle that you can drag where you like - this is the point around which the image will rotate. 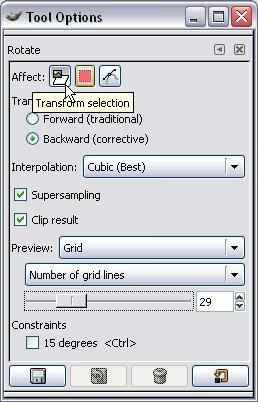 You can drag the grid and it will rotate around this point. However, how do we know how much we need to rotate it? Normally, when you move a grid like the one in the screenshot on the right, it will rotate it in that direction so the image will end up twice as rotated. If you double-click on the tool icon in the tool box, you will get the 'Tool Options' dialogue box like the one on the right. Backwards, which moves the image back to where the grid was before you moved it. 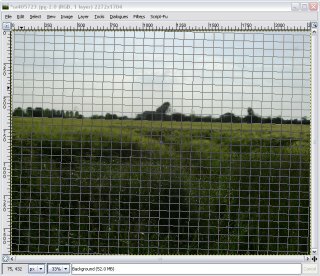 So, select backwards and rotate the grid so that the formerly horizontal lines now run parallel with the horizon. When you clicked on the image and the grid appeared, the rotate dialogue box also appeared. This is it on the right. You can see just how small the correction angle is as well - only 1.56 degrees. Note that the angle of the grid is the angle relative to the centre of rotation and relates to where you have the mouse in relation to that. In other words, if you can't get the angle quite right - just a bit one way or the other - then move the mouse further away from the centre of rotation and you will get a finer resolution on your angle. ...and this is what you have. Note that if you don't like the results, you can press [Ctrl][Z] to undo the edits, one at a time, and [Ctrl][R] to redo them. 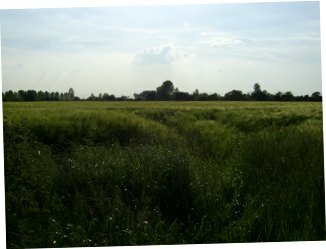 This is a typical picture where the sky is fairly burnt out and the fields are too dark. 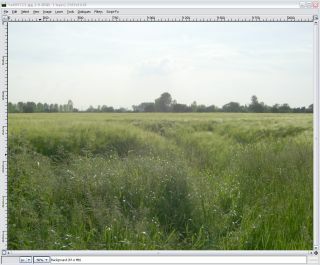 The main control that most image editors have is gamma. This allows you to lighten and darken things. The sky looks reasonable but we can see even less of the field. Now, we can't see anything in the sky - so much for taking that picture. Let's look at the distribution of densities in the image using the levels tool. Here you can see that we have a lot of dark and a lot of light pixels but not a lot in between. This explains why the gamma correction didn't work because whilst we were expanding one part of the density range, we were also compressing the other. So, how do we spread the densities into the gap in the middle? If we use the curves tool instead, we have much more control over where the densities go. In the diagram on the right, you can see that the x axis is the input density and that the y axis is the output density. Just to make it clearer where things are in your image, the graph from the levels dialogue box is superimposed over it. Now, we can fix the image. When you start off with this tool, the line you can see has no points on it apart from at the beginning and at the end and it just travels in a diagonal straight line. You can grab one of the end points with the mouse and move it to where you want or, you can click somewhere on the line - introducing a new point - and drag it where you would like the line to go. To remove a point, just drag it out of its range. Being a smooth curve (look at 'Curve Type' towards the bottom right), the computer draws a smooth curve between the points. If you want to make more of a 'corner', you can just add another point so that the line goes where you want it. If you want to make the curve finer, you can click on the 'Free' curve type (the one with the jagged line) and then, you can make the graph do what you want. For our image here, the area on the left can be spread over more of the density range - here, taking up around three quarters of it and the area on the right can still occupy the range it did before but in this case, the brightest density in the original is not as bright as it could be so that is moved over as well. Normally with a graph like this, I would flatten the bit in the middle to prevent solarisation of the intermediate pixels which can be an unwanted effect here. And here is the final result. We can now see the detail in the sky (remember that we extended the density range up to white so its contrast is increased) and the detail in the field (which again has had its density range greatly extended). The next step is to remove the National Grid and the car factory. The best way of doing this is to use the clone tool. The clone tool is like magic paint where your paint is your picture. When dragged across an image, the clone tool picks up a piece of the image and translates it through a vector to where the mouse cursor is. This has the effect of keeping image detail (such as noise and other textures) as well as keeping any tones that are their so that if you are copying something across a density gradient, you effectively 'draw' with the local colours and textures. 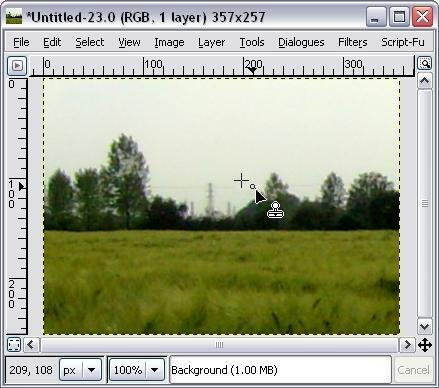 Just click on this tool icon and you will be able to draw over any area of the image with parts of the image itself. that you use the aligned option. The aligned option means that the vector (x,y offset) that you chose originally will be used again and again until you redefine it. 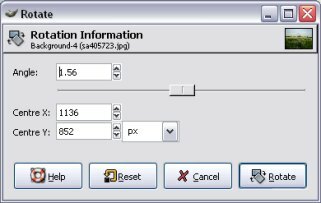 If you chose non-aligned, it would use the original source point each time you started a 'draw' operation. Like any 'draw' tool, the size and other qualities are taken from the current brush. Access this by clicking on the brush area in the main toolbox. Note that there is an option to generate your own brush shape and hardness. move the mouse around just as you would with any other drawing tool - releasing the mouse when you have finished. If you have selected 'aligned', the next time you click the mouse to clone, the vector will be the same. If you have selected 'non-aligned', the next time you click the mouse to clone, the starting point will be the same and a new vector will be stored and used. So, how good is the clone tool? This is the original image with the 440,000 Volt pylon and the odd car factory chimney. If you do an 'edge detect' on it, you can see the detail in the sky. First of all, let's try just copying a gradient over the sky that is effected. And this is the end effect. I took the colours (using the dropper tool) of the sky at the top and bottom of the gradient and used the gradient fill tool in the above mask. It does look rather flat and featureless - rather false. This is what it is like with the edge detect used in the same way as above. You can see that the natural grain/variations in the sky are taken out, leaving us with a gradient that is uniform. We need to be able to copy the natural gradient from the sky itself to make it more convincing. This is the result of using the clone tool. I took a source area that was close to where the clone tool drew so that the density was fairly similar. It does look a lot better. And this is the edge effect used in the same way as above. You can see that the texture of the sky has remained. If used carefully, the clone tool can be used to remove imperfections in images such as skin blemishes on models' faces, birds in the sky, power lines and so on. Internationalisation and Localisation (or if you are not a fluent typist; 'i18n' and 'l10n' because there are 18 characters between the 'i' and the 'n' of 'internationalisation' and 10 characters between the 'l' and the 'n' of 'localisation') are two separate but related processes. Internationalisation ('i18n') takes a program and separates the words and phrases used in the user interface, from the programming itself. These can be stored in an external database and accessed by the program when it needs to. So, if your program previously displayed the word 'File' in a menu, it now looks up the word that it needs to use in that place and displays it -- thus 'File' appears again. Whilst that might see totally pointless, the process of Localisation ('l10n') can replace the default database with one in another language. This makes it comparatively easy to make a version of a program that works in any language because you don't need to go through many thousands of lines of code, looking for bits of text and then translating them - instead, you just work through a database. However, this needs to be done properly and there are two processes to test. The first is i18n and this can be tested by using a language to check that everything has been caught (no menus or dialogue boxes have escaped the process). The second is l10n which a local translator can do once the i18n has been completed. There are a number of test languages that are used for i18n and if you look at the language section of Google, you can see some of them - on the right, you can see the Google interface in Klingon. Just click on 'Language Tools' from the main search page to see them and try them out for yourself. Little is more annoying than something that has just stopped working for some reason and looks as though the only way to get rid of it is to have to kill it (with the exception of having to reinstall Windows). If all else fails, you will need to kill its window although I would recommend finding out why it appears to have stopped (it might be waiting for a resource to become available or in the middle of a long procedure) and solving that first. This is, in effect, a last resort. if you have a console open, just enter xkill. When xkill is running, it will display the skull and crossbones that you can see in the screenshot and the next thing that you click on will be killed. Note that if you have a multi-window application open - for example, the GIMP - then all of that application will be closed down. If you click on something by accident (such as KDE), you will need to know how to restart it. If you are going to put its icon on a panel, then as a precaution, we would suggest that you don't have an icon for xkill anywhere you are likely to click on it by accident. Also, any icon you choose should look distinctly different. If you do, then make sure that you can start up a throw-away application (one that can be killed without any consequences such as a dummy xterm session) to kill that instead. One solution is to configure the KDE shortcuts so that the Windows/Tux key will start the KDE menu from which you can use the arrow keys and enter to start a program of your choice. Like all powerful tools, this can be a double edged sword because you can make mistakes with it so be careful. Seeing the screensaver start is particularly annoying if you are in the middle of doing something and only left the machine for a few minutes and you know that from that point on, you will have to use your password to get to your account again. However, on KDE (and on Mac OS X, I am told), you can configure the system so that when the screen trips into screen saver mode, you have a configurable amount of time to get to the computer to rescue the situation. If you right-click on the screen and then select properties, you get the screen on the right. In the settings frame, you can configure the amount of time you have to get to your machine - here, 20 seconds. Don't make this time too long though because if you are waiting for it to become safe to leave, you will have to guess this last time. On a personal note, I have been using Windows (which does not feature this) and KDE (which does) for years and it is a lot better to know that you have a bit of time to got back to your machine. If you want to find out how much processor time and other resources a program uses - effectively finding the minimum system resources required to run a program - you can always use 'top' but if the program you are interested in uses all of the screen - such as a game like Tux Racer for instance - you will have to think of this from another angle. 'top' provides a useful, real-time display of processes and how much resources they use. However, it does require a console to work in so if you have a second machine, use the first method otherwise, you will have to look at the second way of doing this. 1. One way of hacking this is to use your slower machine to ssh into the faster one and run top. This way, you will be able to see how much power is being used in real time although this needs both machines in the same place or, you need to borrow someone to play the game while you watch top on the other machine. ... then run Tux racer. The '-b' switch makes top run in batch mode, the '-d' switch specifies the duration in seconds between each sample and the '-n' switch tells it the number of iterations to make. The '>' tells the system to direct the output to a file called 'tempfile.txt' which is in the current directory. I found that with around 80 processes running, 30 iterations gave a file size of around 250kB. You can do this for any of the processes that were running at the time. This pipes the output of top, through grep which filters it and then that output is redirected to the file. This makes the file much smaller as we are only interested in looking at one process this time. Being a file that has already been filtered by grep, you then look at using 'less' once top has finished. This way of doing it generates a file of only around 2kB for the same situation. So, you know the processor speed (in this case 1.8GHz) and you know what proportion of the processor time is needed during normal playing (around 60 per cent) so you can work out roughly what speed processor is needed (in this case, around 1GHz plus a bit for other things going on that are needed).